Home Health Blog What’s For Dinner? Three Fantastic Recipes! Cooking dinner can be something that we dread and don’t want to do. We’re either too tired, don’t have much time, or simply don’t know what to do. Well, let me tell you that I completely understand. Additionally, there are all these fad diets going on nowadays. Meal prepping is the new way to eat or intermittent fasting will make it easier on us, so we don’t have to worry about food too much, right? It’s all confusing, and what works for one person may not work for the next. Well, don’t fret! It’s okay (: I’m here to give you three of my personal favorite recipes that are super easy, inexpensive, time efficient, healthy, and delicious! So let’s make it, eh? To start you’ll need to get your shrimp thawed out (if frozen). Season your shrimp how you’d like! I use pepper, garlic powder, Lowry’s® seasoning salt, Morton’s® nature’s seasonings, lemon pepper, and a dab of Old Bay® seasoning (just for an added kick and flavor). While you’re seasoning your shrimp, go ahead and throw that spinach on the stovetop in a frying pan. Coat the pan with some butter or olive oil on low heat. Let the spinach cook until it is very tender and shrunken down a bunch. Of course season the spinach as well! I season my spinach when it is cooked down some so it’s easier for me to season all of it. All I season my spinach with is salt, pepper, and garlic powder. And, if I have a lemon, I will squeeze just a tad bit of lemon juice in there too! Now, while all of that is cooking nice and well, take your Birdseye veggie pasta and put it in the microwave (it comes in a cook-able bag and it takes about 4 minutes or so to cook depending on what kind of microwave you have so just follow the instructions accordingly). Now that everything is cooked nicely (our shrimp, spinach and veggie pasta), combine everything into a serving bowl and pour your Alfredo sauce on top of everything and mix it well together. If you like, you can add some extra parmesan cheese on top for extra flavor! And wham! 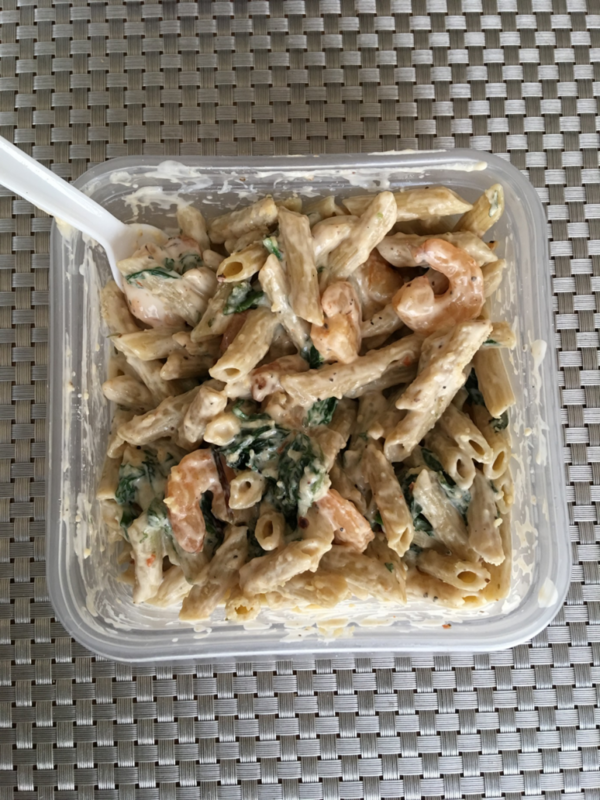 You now have a delicious and nutritious Shrimp Veggie Alfredo. And I bet you $5 that if you cook this for someone and you didn’t tell them what all you used, they’d never guess that they’re eating vegetables. I’ve cooked this for my family a few times because it’s so easy to make, they love it! Plus it’s cheap! And what a great way to get some extra veggies in, right? Okay, so this one right here is actually one of my FAVORITE dishes to make! It’s so easy and soooooo delicious for those days when you want some good ole hibachi but you don’t want to pay $20 for it! Other veggies like broccoli, carrots, etc. To start, cut your veggies to your liking. Once they are cut go ahead and throw them on the frying pan with some oil or butter on a low-medium heat (you don’t want them to burn. You want them nice and tender). Let’s season them while they’re cooking. I would use pepper, garlic powder, Lowry’s® seasoning salt, Morton’s® nature’s seasonings, and a dab of Old Bay® seasoning. Let those cook down for a minute while you’re working on your shrimp or whatever meat you choose. Season the meat how you see fit. I seasoned my shrimp with pepper, garlic powder, Lowry’s® seasoning salt, Morton’s® nature’s seasonings, lemon pepper, and a bit of Old Bay® seasoning. So once our veggies are done let’s put those to the side so our meat can go on the pan and cook. Once the meat is good and done, let’s put those veggies back into the pan and coat everything with some teriyaki sauce to blend the flavors together. Let that sit in the pan on low for about 2 or 3 minutes or so. While that’s simmering, let’s get that Minute Rice® in the microwave! Just follow the instructions accordingly but I believe it’s just in the microwave for literally 1 minute. Once that’s done, get your bowl and put the rice in it. Then, take your meat and veggies out of the pan and add it to the rice. Now for my favorite part! 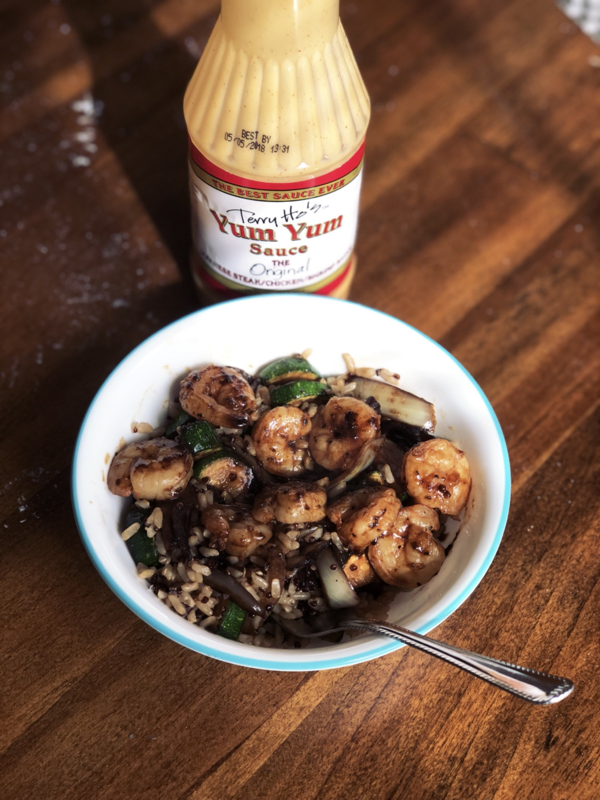 Once everything is in the bowl, you’re going to coat it all with some delicious Yum Yum sauce! Because, the sauce makes the dish honestly. And not to mention that Terry Ho’s Yum Yum sauce (the original and the best) is sold in Walmart, Target, Kroger, Publix, literally everywhere! (And what makes his sauce so great is that he’s from Albany, GA, my hometown!) Once that’s all done go ahead and take you a seat and take a trip to Nirvana where you belong with peace and happiness because this bowl of hibachi is about to take you to Heaven! 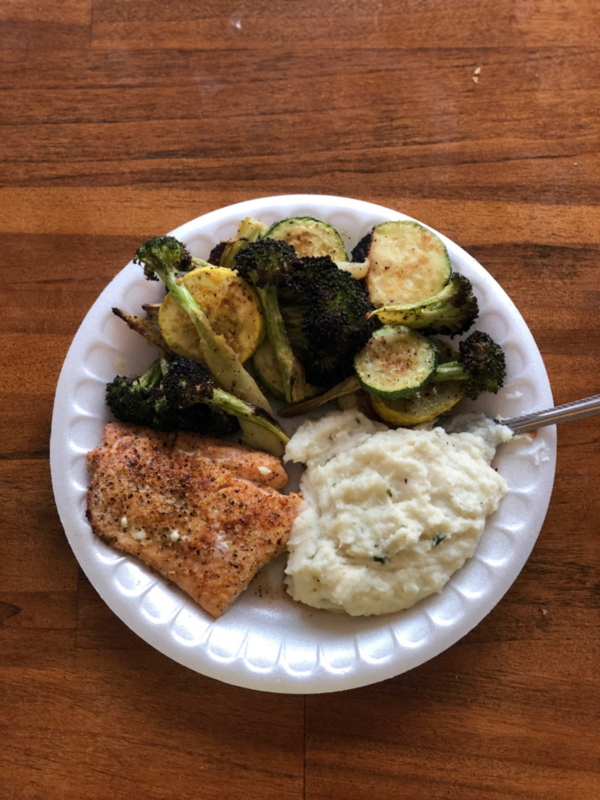 Salmon with Veggie Mash, You Say? This is another one of my personal faves. Honestly, they’re all so good I couldn’t tell you which one is the best. This one just looks fancy and difficult but it might be the easiest of them all! I hope you’ve enjoyed these recipes as much as I do! And if you decided to try them at home I wish you the best of luck! Happy healthy eating!